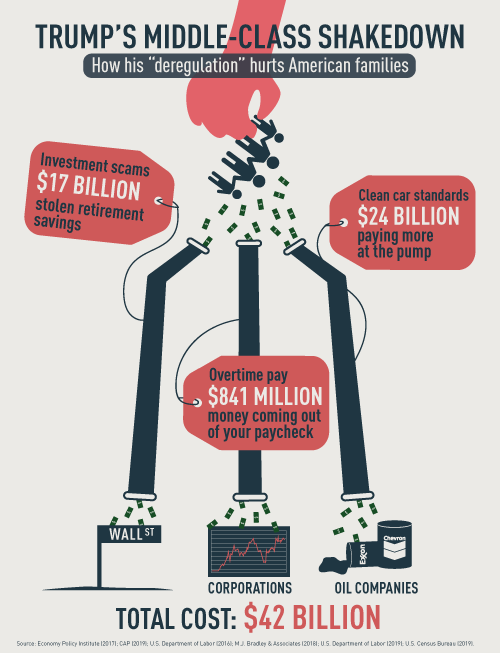 In a set of regulatory rollbacks, Trump is taking aim at our retirement savings, overtime pay, and how much we spend at the gas pump—all to line the pockets of his corporate cronies. In total, these rollbacks will cost Americans nearly $42 BILLION. Share this graphic on Facebook and Twitter to spread the word. If you needed any more proof, here it is. Trump doesn’t care about hurting working people as long as his interests are served. Get the word out by sharing this graphic on Facebook and Twitter. While Republicans in Congress are busy covering up Trump’s crimes and stealing money from working families, House Democrats are tackling two key issues with comprehensive legislation. CLOSING THE PAY GAP: It’s 2019, and women still make just 80 cents to every $1 made by a man (it’s even worse for women of color). House Democrats (with the help of seven Republicans) passed the Paycheck Fairness Act of 2019 this afternoon to help fix that. The bill has unanimous support from House Democrats and is a key step toward closing the persistent wage gap. And in case you needed another reminder of why this legislation is so necessary, don’t miss Rep. Bradley Byrne (R, AL-1) mansplaining equal pay to Rep. Susan Wild (D, PA-7). COMBATING CLIMATE CHANGE: This morning, House Democrats introduced the Climate Action Now Act to tackle the looming threat of climate change. The bill gets the U.S. back on track to hold up its end of the Paris Climate Agreement. Since Trump announced U.S. withdrawal from the Paris Agreement two years ago, cities, states, universities, and businesses have stepped up to lead key climate initiatives. With the introduction of the Climate Change Now Act, House Democrats are filling the leadership void left by a Republican party unwilling to act on a climate crisis that already impacts Americans every day.